Dormant account and Frozen account both looking somewhat similar but both are very different from each other. These terms are used while we talking about the accounts in which the Bank has stopped transaction activity. Banks can make both saving as well as current account dormant and frozen. In dormant account, there is no activity from a very long time by the account holder like Debit, Credit, cheque issue or any other activity except interest posting by the bank. If An account holder don’t do any type of activity in period of 1 year, this account automatically becomes an inactive account and if this continue for a period of 2 year. It becomes a Dormant Account. 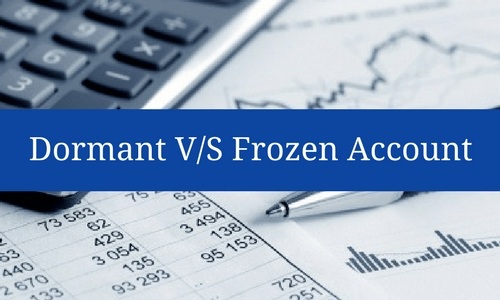 In Frozen account, An Account holder is not in position to do any transaction until any decisions taken. All type of transactions get a hold and restrictions become tighten if bank finds it improper. If an account is not used for a specific period, it is called Dormant account. In account, If the whole transaction activity is posed by a bank. It is called frozen account. It is also called inactive account or inoperative account. It is also called a blocked account. Banks by themselves do the dormant account as per RBI Guidelines. Banks cannot do it by themselves. RBI, SEBI, judicial authority and income tax authority only. No activity done by account holder in an account for a period of 2 years. There must be some suspicious activity being done on this account. Banks directly put hold on transaction in the account. Application with specific reason of inactivity. Power to reactive is only after completing legal procedure by specific authority. Change of the city, job change and many more. Suspicious activity like Money laundering, illegal activity, Unpaid tax, Unpaid loan to an organisation, Terrorist activity.